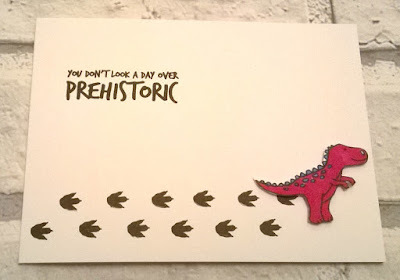 Today I am sharing some Dinosaur themed cards. 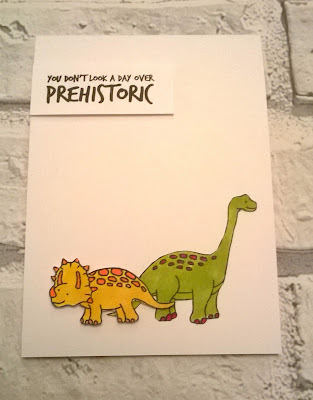 My daughter and her friend are a little Dino crazy and after a week of mock exams I treated her to a set of Dino Friend stamps from Hunkydorys For the love of stamps. 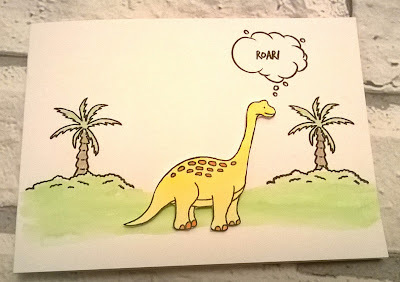 After a couple of hours stamping, colouring and cutting here's what I made. I love a clean and simple card and this is just that. 2 dinos stamped, coloured, cut and mounted on a card. This one is a little bit of fun, I can't tell if her looks like he's running after someone or way from something. Now I saved my favourite till last, I stamped and water coloured the background and then stamped,water coloured and fussy cut the dinosaur. It's so simple and clean and it's going nowhere, I'm keeping it as I love it so much.